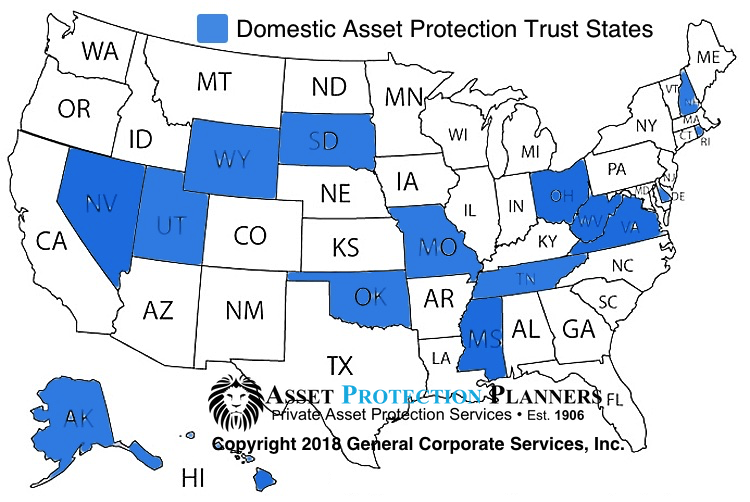 The first two asset protection trust states were Alaska and Delaware (1997). Two years later (1999) Rhode Island and Nevada followed suit with their domestic asset protection trusts (DAPT) statutes. There are 12 other states that now (as of this writing) have DAPT laws on their books. These are: Utah (2003), Oklahoma (2004), Missouri (2005), South Dakota (2005), Tennessee (2007), Wyoming (2007), New Hampshire (2009), Hawaii (2010), Virginia (2012), Ohio (2013), Mississippi (2014), and West Virginia (2016). The four most populous states, California, Texas, Florida and New York have not adopted these statutes. Each jurisdiction clearly defines the regulations that DAPT settlors have to follow in order for their trust to be valid. It’s interesting to note that no existing DAPT has been tested all the way through the US court system. Industry experts surmise this is because nearly every concerned party believes that DAPTs will hold up in court. If they bring a debtor to court at all, creditors are more likely to settle for much less when they find out that the assets they hope to access are protected by a DAPT. An out-of-court settlement is considered a win for a debtor/trust settlor. The amount is often significantly less than a creditor/plaintiff’s original figure. Additionally, the debtor is spared from having to shoulder the cost a protracted court battle, which can be prohibitive. The big problem we have seen with domestic trusts is that they are subject to domestic judges. Many judges issue results-oriented rulings with more regard to their ultimate motive than with regard to the law. Many attorneys we make this comment to spout, “Yes, that’s the story of my life.” This is the reason we have two types of law. “Statutory law,” which is written in the law books. Then we have “case law,” which is how these laws play out in the courtroom. We have seen domestic trusts breached repeatedly by such members of the local judiciary. Moreover, they often do not hold up unless you live in that state. For example we have repeatedly seen California asset protection trust case law where judge’s rule based on local statutes and ignore the out-of-state trust legislation. For example, the judge says to the Nevada trustee, in essence, “Nevada has asset protection trust state laws. California doesn’t. Your client lives in California, so turn over the money.” We have seen the same results in federal court. Therefore, if you want asset protection that works, the bottom line is this: set up an offshore asset protection trust. The main reason is that offshore trustees are not subject to U.S. court orders. To significantly increase protection, one should hold assets in an offshore asset protection trusts (OAPT). In fact, foreign jurisdictions were the first to offer asset protection trusts. In the beginning, OAPTs were strictly for extremely wealthy individuals. No longer. Professionals in fields with a high risk for litigation have turned to OAPTs to help protect their hard-earned assets. This includes physicians, executives, lawyers, and successful business owners. This is not just from North America, but from other regions as well. The preeminent offshore asset protection trust jurisdictions are Cook Islands, Nevis and Belize, in that order. The statute of limitations on fraudulent conveyance timelines in these jurisdictions are short. That is, once a period of time has elapsed, their courts will refuse to entertain challenges to the transfer of assets into the trust. OAPTs have a number of advantages over DAPTs. They are governed by countries with laws that tend to favor trust settlors rather than their challengers. For instance, their regulations on fraudulent conveyance are more liberal compared to the regulations in the United States. Very briefly, transfers to a trust may be deemed fraudulent for one main reason. That is, if they are judged by a court to have been transferred with the intent to keep them away from a creditor’s legitimate claim. With few exceptions (Nevada and Ohio, for example), most DAPTs have look-back windows of four years. This means, assets transferred to DAPTs, in states other than Nevada and Ohio, are deemed safe and non-fraudulent if they have been transferred longer than four years from the date the lawsuit was filed. By comparison, many OAPTs have a much shorter statute of limitations on fraudulent conveyance. Typically, this is only two years. Belizean courts will not even entertain a claim of fraudulent transfer, for certain claims, against any trust that has been properly established under its law. 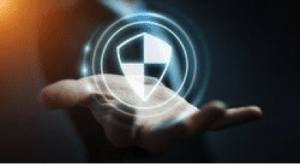 There are several other differences between offshore and domestic asset protection trusts, often ending up with offshore jurisdictions handily beating their domestic counterparts. So, why even consider setting up a DAPT when international locations give asset owners so much more? Some uneducated asset owners are simply not comfortable housing their assets in such far-flung locations. Others are wary entrusting their assets to foreign trustees who are not governed by U.S. laws. And some Americans simply prefer to fly under the radar at the current time when a nation-wide climate of distrust seems to label any foreign connection as suspicious. So, we offer a hybrid option called a Trigger Trust TM that is a domestic trust initially, that turns into an offshore one when the need arises. With so many options, it is best to sit down with an asset protection expert to help you make this decision. An asset protection trust is a vehicle that holds and safeguards an individual’s possessions from creditors, judgements, and lawsuits. A trust has its own legal identity that is separate from its settlor. It can own property as well as stocks and bonds, maintain bank accounts, engage in business, and enter into contracts. It is the trustee who engages in these activities on behalf of the trust. It is this clear distinction between a trust settlor and the trust assets that protects the assets. 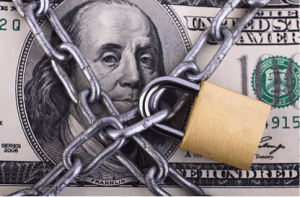 When a settlor is sued and ordered to pay restitution, the creditor/plaintiff cannot touch the assets held in a trust since, legally speaking, they no longer belong to the settlor. The wall that exists between settlor and trust is an effective armor of protection that is not easily breached. An asset protection trust is a versatile and potent instrument. It can stand alone or (ideally) be an integral part of an estate planning scheme. It can be paired with a limited liability company (LLC) to provide added layers of protection. Plus, when you hold an LLC inside of your trust, you now have a company you can manage to control trust assets while the waters are calm. When legal bullets fly, you simply have the trustee step in as LLC manager. The role and prominence that an asset protection trust plays in defending and preserving wealth largely depends on an individual’s circumstances. In setting up an asset protection trust, it is important to keep in mind that there is no such thing as an asset protection template. Every person’s needs, plans, and circumstances differ. So, consult a seasoned asset protection planner who knows from experience which legal tools work in which circumstances. There is no one-size-fits-all solution when it comes to trusts. Beware of an asset protection professional who maintains otherwise. As its name suggests, an asset protection trust shields and preserves an individual’s possessions and resources. There has been an increase in the number of jurisdictions that allow for the establishment of asset protection trusts. 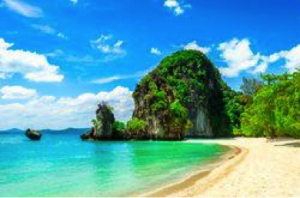 As we have covered, in addition to U.S. states that offer domestic trusts, individuals also have the option to set up offshore asset protection trusts. There are advantages and disadvantages connected with each option. The challenge for asset owners is to decide which asset protection instrument offers the best shield for their assets. No matter which asset protection trust you select, it is crucial to act decisively. Unprotected assets are tantalizingly attractive to predatory plaintiffs. The sooner you have your assets fortified by an instrument such as an asset protection trust, the safer they will be. The strength of an asset protection trust lies partially in its irrevocability. Once a settlor or grantor transfers an asset to the trust, he or she separates himself or herself from the asset. It now belongs to the trust, which is under the control of a trustee. This way, should a creditor attempt to attack the settlor’s assets held in the trust he faces a tremendous barrier. This is because the settlor no longer owns them. However, in a handful of jurisdictions, a settlor can continue to derive benefits from the assets according to the terms of the trust that were set forth when it was established. In order for a trust to further protect assets, it must be a spendthrift trust. This means a beneficiary cannot assign his or her interest in the trust to a third party, such as a creditor who has won a case against them in court. If a benefit has already been disbursed to the settlor/debtor, it becomes fair game for the triumphant creditor. However, the trust can withhold the disbursement of the benefit, thereby preventing a creditor from laying claim to them. For this reason, a trust grantor cannot also act as the trustee. Otherwise, the court can simply order the trustee (who has lost a case in court) to pay restitution to the creditor, exposing the assets in the trust which he controls. For added protection, trusts established in the United States should ideally be administered in the state where it has been established. Some trust administration can take place outside the state, such as administration of real estate property outside state lines. But as a rule, it is best if most of the trust administration activity takes place in the trust’s home state. It is prudent to establish a strong connection to the state where the trust is domiciled. This link can play a pivotal role in court when the legitimacy of a trust set up in a non-resident state is challenged. As indicated above, a settlor may have to reside in the state where the trust is setup in order to enjoy its protection. Asset protection is no longer a concern solely for ultra-rich individuals. Nowadays, it seems almost everyone has a reason to sue just about everyone else. Successful professionals working in fields with a high risk of litigation need to be more proactive in protecting their assets. An asset protection trust is an effective vehicle that offers several benefits. It may seem ironic, but sometimes the best way to protect your assets is to surrender control over them. This is precisely what asset owners do when they establish an asset protection trust. By erecting a wall between them and their assets, it legitimately places their assets beyond the reach of creditors. It can also act as a deterrent because creditors know they have to work harder to get at your assets held in a trust. Asset protection trusts can be established domestically (in 16 states) or in offshore locations. There are pros and cons attached to both. They key to making this decision lies in your individual goals, needs, and current and future plans. 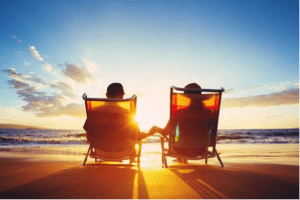 Only when you have secured your assets can you kick back and live the life you want, knowing that the assets you have worked hard for are safe. Seek out an asset protection professional who recognizes that every asset protection plan must be tailored to a client’s specific circumstances. Anyone else who holds a contrary view will be doing you a disservice.